When I was but a whippet of a girl, I fell in love with The Fairmont Hotel in San Francisco, hoping that one day, when I grew up, I might be lucky enough to stay there. At the time I knew that the hotel location was real. I also knew that it was in San Francisco, but I didn’t realise that this hotel was called The Fairmont because to me it was the St Gregory, the subject of a successful TV series called Hotel based on the 1965 novel by Arthur Hailey. For anyone who’s read the novel, you’ll know that the original St Gregory was in New Orleans, but when Aaron Spelling produced the series he moved the location to the Fairmont Hotel in San Francisco. To confuse the issue even more, Canadian Hailey wrote Hotel at another of the Fairmont group: the Royal York in Toronto, and at the Fairmont in San Francisco, the Laurel Court Bar serves a cocktail called the St Gregory, which was created in 1983 to commemorate the commencement of filming for the t.v. series. So, in summary, Hotel was inspired by a hotel in Toronto, set in a hotel in New Orleans and ended up being filmed at a hotel in San Francisco. Got all that? There’ll be a pop quiz later. In the almost five years (1983-1988) that Hotel graced our screens, I never tired of it. Each episode was peppered with new guest scandals and cons and complaints and missing luggage and lovers’ trysts and business deals being struck and I watched, intrigued, as in spite of all the daily distractions affection still grew between the characters of Peter McDermott, the General Manager (played by James Brolin), and his assistant, the delicious Christine (Connie Sellecca). For me, watching Hotel was like taking an hour-long holiday to San Francisco, in the utmost of style. They’ve recently released the first series on DVD (about time, too) so at last I’ll be able to show Monsieur what first hooked me on staying at The Fairmont now that we’re all grown up. Rising high above San Francisco, which it observes from its perch on Nob Hill, The Fairmont is the absolute grande-dame of hotels in this city. Developed by a pair of silver mining heiress sisters called Fair, they sold it just a few days before the 1906 earthquake and fire. As buildings toppled throughout the city, still it stood, high on the hill, its lofty location protecting it from the post-quake waves flooding the reclaimed downtown area. Certainly The Fairmont did not go unscathed; when the fire spread to Nob Hill, it suffered from fire and smoke damage, its windows destroyed by the heat. The earthquake’s legacy was also responsible for a certain amount of internal structural damage, but the main body of the building remained rock solid as all around it lay smoking rubble and utter devastation. If the concept of ‘survival of the fittest’ could be applied to buildings, you’d have to say that the Fairmont is at the alpha end of its league. Exactly one year after the 1906 earthquake, the restored Fairmont opened amidst great festivity with a banquet including 600 pounds of turtle. Since that time, it has survived whatever the various eras have thrown at it, from depression to fading beauty in the frugal times of war, times of regeneration and slumps in tourism. It is the Bay Area base for visiting American Presidents, boasts a penthouse that provides sweeping views of the bay, a two story library and a game room at the rate of $12,500.00 per night and has been the showcase for the handiwork of some of the best architects and designers of its time. 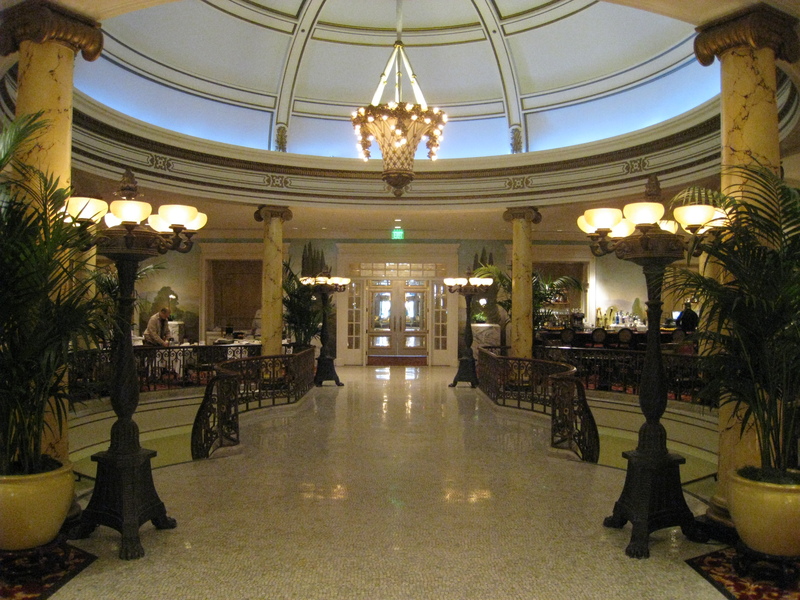 Julia Morgan was the architect and engineer charged with The Fairmont’s restoration following the earthquake of 1906. She was a trailblazer, not just for women in her profession but for the then uncommon use of reinforced concrete in earthquake-zone buildings, strengthening them against earthquakes and employing such methods in her work on The Fairmont. Dorothy Draper, renowned interior designer of the post-war era, also left her mark on the hotel, decorating it in the rich colours of red, black and gold, with the aim of blending Venetian elegance with San Francisco romance. When her newly designed Venetian Room reopened in 1947 as San Francisco’s premium supper club, it attracted the likes of Marlene Dietrich, James Brown and Ella Fitzgerald as headliners, continuing to wow both guests and public with a string of top-flight entertainers for decades to come. The Fairmont’s Garden Room was the venue for the drafting of the Charter for the United Nations in 1945 and the flags of the nations who took part in the creation of this draft now fly at the main entrance to the hotel. When you trip the light fantastic on the dance floor in the famed Tonga Room, you’re dancing on the original deck of the SS Forrester, one of the last tall ships whose regular route ran between San Francisco and the South Seas. Don’t be surprised when the thunderstorm hits the Tonga Room. That’s right: there is regular thunder, lightning AND rain inside. Tony Bennett first sang ‘I Left My Heart in San Francisco’ in the Fairmont’s Venetian Room. Some of the signature cocktails at the Tonga Room include: The Tonga Itch, Lava Bowl, Tonga Tart (who, me?) and the Tematangi Ubangi, which OBVIOUSLY contains tequila. The name says absolutely everything about this Tongan concoction which will certainly make your head a bit bang-y if you ignore Dr Epic’s advice to consume in moderation. Caffe Cento is the place to grab a proper continental-style coffee while watching the trams come and go at the stop directly outside. It also has an excellent stock of Ghirardelli chocolate in case you need a sugar rush after climbing one of San Francisco’s hills. The Fairmont Hotel is allegedly home to a number of ghosts including a group of WWII soldiers who once stayed on the seventh floor and a prostitute who was murdered in her room but now chats to guests whilst lounging in her red teddy on a ghostly four-poster bed. Vertigo, The Rock and Midnight Lace are among the many films that have used The Fairmont as a location. Famous guests read like a Who’s Who directory: 10 US Presidents are on the list, along with royalty from the Middle East, Europe and Japan. The Dalai Lama has stayed at the Fairmont, as has Muhammed Ali. Shirley Temple Black, Nat King Cole and Maurice Chevalier are past guests, along with Clint Eastwood, Cyd Charisse and Duran Duran. The Fairmont of San Francisco may now also add two more esteemed guests to their long list: The Epicurienne and her Monsieur. The Fairmont Hotel has given its name to a group of luxury hotels throughout both North America and the world, many of them landmarks in their own right. For instance, London’s famed Savoy Hotel, home of the best Bloody Mary on the planet, is part of The Fairmont’s stable, as is The Fairmont Chateau Lake Louise in Canada, with views over one of the most beautiful lakes in the world. From shaky beginnings, literally, the name ‘Fairmont’ has become synonymous with quality and that is why Monsieur and I chose the Fairmont San Francisco as the first stop on our honeymoon. Just wait until you hear about the breakfasts in the Laurel Court and room service with a view for a certain unfortunate invalid. Just as I’d always known it would be, our stay at the Fairmont San Francisco was quite unforgettable, even if we didn’t have the chance to chat with the long-deceased prostitute in her cheeky red teddy or dance on a long-deceased ship’s original deck. You never know, though. Even if we wait another twenty-something years to revisit the Fairmont, I have a funny feeling that the hotel, the ghosts and the Tematangi Ubangi will still be there, for there are two immovable rocks in San Francisco and the Fairmont Hotel is one of them. Previous Post Aloha, It’s Friday! Sorry. Didn’t have time to read the whole post but the photo is lovely! Hope you’re having a fab time! S Le – sadly we got back about 6 weeks ago so the honeymoon is in the past. Bummer, huh? But yes, thank you, we did have a wonderful time. Epic, you’ll love this story. When I lived in SF in mid to late sixties, my father and aunt arranged for me to meet the owner of the Fairmount Hotel who was a family acquaintance of some sort. His name was Ben Swig. He was originally from Mass. Anyway, I went to the Fairmount in the best outfit I could manage, I. Magnin comes to mind since my hippie dippie outfits were outlawed by my aunt. I was taken to a private elevator that took me to the top of the hotel into what I now believe is that 12K a night suite. It was all very cordial. He asked if he could do anything for me, I of course said, “No, not a thing.” I think he sent a big basket of fruit the next day. I just remember the elevator was all inlaid wood! Pat – you’re right! I love that story about you at the Fairmont! How fascinating. I just googled Ben Swig and saw that he was a massive philanthropist as well as one-time owner of the Fairmont Hotel. How lovely to have met him. What an absolute honour. I’m ever so slightly blown away by your experience. Thank you so much for sharing it with us.